Prith Banerjee, director of HP Labs, will give the keynote address at the Baskin School's Research Review Day. The innovative and transformative research conducted by faculty in the Baskin School of Engineering at the University of California, Santa Cruz, led to a record $27 million in gifts and research awards in the 2007-08 fiscal year. The school's Research Review Day on Friday, October 17, will include faculty research presentations, graduate student posters, and more. 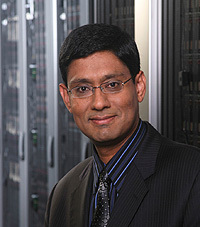 The event features a keynote address by Prith Banerjee, senior vice president of research at HP and director of HP Labs, the company's central research organization. Banerjee's talk, "The Modern Research Lab" begins at 9:30 a.m. in the Engineering 2 Simularium (Room 180). He will discuss the major themes guiding high-impact research at HP Labs and share examples of some of the innovative projects being undertaken there. "The school and its departments have been developed specifically to meet the technology demands of the 21st century. The research being pursued by our faculty is already meeting those needs, and their work is truly leading edge," said Michael Isaacson, acting dean of the Baskin School of Engineering. Research on six core focus areas will be presented by Baskin School faculty in a broad array of talks, including "Content-Driven Reputation on the Internet," "Single-cell Manipulations," "New Approaches to Renewable Energy," "Video Games and Computational Media: Communicating Through Code," "The Evolutionary History of the Human Genome," and "Engineering Hope with Biomimetic Systems." These presentations will focus on some of the wide-ranging research projects in the Baskin School of Engineering that have transformed nearly every aspect of science and engineering and have enabled Baskin researchers to construct the world's first web-based genome browser, create an artificial retina enabling the blind to see, and develop the first program in computer game design in the UC system. In addition to these presentations, attendees will have opportunities to talk with the graduate students involved in this ground-breaking research. Visit the Research Review Day web site for additional information, including a detailed program with a complete list of presenters and topics. Note to reporters and editors: Reporters are welcome to attend this event, but must register in advance by contacting Tim Stephens in the UCSC Public Information Office at (831) 459-2495 or stephens@ucsc.edu.